A VIN, or Vehicle Identification Number, is a unique "fingerprint" assigned to a vehicle to allow it to be identified. All vehicles currently made in quantities over 500 are required to have a VIN number assigned to them. VINs have taken a variety of shapes over the years. In early cars a VIN was simply a serial number, recording what sequential number a vehicle was in the production run. The identification number was inconsistent and overlapped across manufacturers. This caused endless confusion when people wanted to identify a particular car. 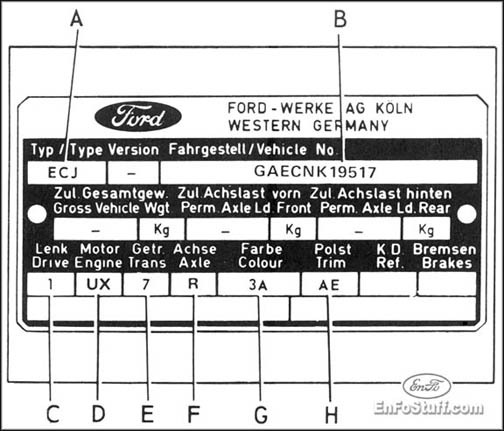 Then manufacturers started encoding other information into the VIN, such as manufacturer code, year, even model number. This made it easier for people to associate vehicles to a unique identifier. The VIN became a more important tool to both manufacturers and owners. But still unfortunately the system was flawed. Since no one oversaw how VIN numbers were created and assigned there was still a great chance that there would be overlap between manufacturers. It also prevented anyone from looking at a vehicle identification number solely and be able to positively identify a car just by that number. Modern-day Vehicle Identification Number systems are based on two related standards, originally issued by the International Organization for Standardization (ISO) in 1979 and 1980; ISO 3779 and ISO 3780, respectively. Compatible but somewhat different implementations of these ISO standards have been adopted by the European Union and the United States of America. This standardization of VIN numbers meant that a unique series of digits could finally be assigned to only one vehicle, without the possibility of overlap. The 17-character VIN was born. Everyone from parts manufacturers to law enforcement use VIN numbers to trace, track, and positively identify vehicles. Each modern vehicle has the VIN number printed in several places on the vehicle, including on the frame. This allows identification even in the case of severe damage from accident or fire. It's a good idea to be aware of your VIN number. It's not necessary to keep it secret, as every car has it clearly printed on it in plain sight. But it's a good idea to have this number handy (such as on a copy of your registration) in case of theft or catostrophic damage.